Want to get deeper into your backbends? They are a rewarding part of a yoga practice, but jumping into them too quickly or deeply is an easy way to injure yourself. However, using a yoga wheel is a great way to warm up and work towards achieving these poses in a gentle and supportive way. You will find this practice opens your shoulders, opens your hip flexors and stretches the whole front body. These 6 poses make up a more advanced practice. They are intense as we work towards a full camel pose. As they are deep stretches they are not suitable for beginners or people who have limited mobility. If this is you, please do check out some of my beginner practices first and work your way towards this one. You will of course need a yoga wheel for these poses, as well I recommend a set of blocks. Yin yoga poses are typically held for an extended length of time, upwards of 5 minutes, however since these poses are quite intense, don't feel you have to hold them for quite as long. Instead hold them for about 2-3 minutes each. 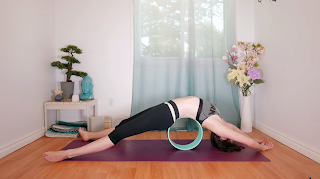 The following makes up most of my Yin Yoga with Yoga Wheel practice, which can be found over on my YouTube channel. 1. Supported Fish Pose - Sitting at the top of your mat (so that you have room to roll backwards). Gently recline onto the wheel so that it sits on the mid to upper back. Legs can either extend in front of you, or for a hip opener bring the feet together and open the knees wide into butterfly pose legs. I like to clasp my hands and reach my arms up overhead here as well to intensify the stretch further, however you may simply allow them to rest at the side. Take a moment to get settled here and find stillness. Once you have done so, close the eyes and connect with the breath. 2. Supported Bridge Pose - Bend your knees and bring the soles of your feet to the ground. Pushing into the feet, start to rock back onto the wheel until the wheel is more on the mid back. Extend your legs out in front of you, as the arms keep reaching up overhead or wherever is comfortable. After holding here for a few minutes you can take the pose deeper. Bend the knees one at a time, again bringing the soles to the mat. Use your hands to gently roll further back onto the wheel, bringing it under the sacrum/low back. If possible, catch hold of each ankle with your hands. Hold for about 3 minutes. Relax the neck, head and anything else that doesn't need to be working. Let the hips be heavy on the wheel. 3. Waterfall Pose - With your hips supported by the wheel, extend the legs up toward the ceiling. For help balancing you may want to extend your arms out to the side. Allow yourself to get heavy and soften to the wheel and ground. This pose is not meant to be challenging, but instead a chance to relax the low back. After holding for a few minutes, bend the knees and lower the feet to the ground. Carefully roll your way forward to get off of the wheel. 4. 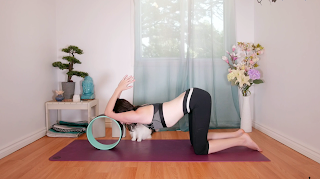 Puppy Pose - Making your way to hands and knees, bring the wheel in front of you. Set your hands onto the wheel and roll it so that your elbows are connecting with the wheel. Bring your hands together, and bend the elbows. Keep your hips stacked over the knees, with the knees hip distance apart. Set the forehead to rest either on the biceps or between the arms directly on the wheel. Melt the heart down. You may need to inch the wheel away to get a deeper stretch. Relax the shoulders down, engage the core. With every breath see if you can let your upper body get heavier, and relax towards the floor. 5. Splits Pose - Set yourself up with the wheel in front of you and a block on either side. From your knees, place the right ankle and calf muscle on top of the wheel and slide it forward keeping the back leg in place. Don't worry about straightening the legs, let your right knee bend as much as it wants to. Be kind to your wrists, pushing down through your fingertips and knuckles instead. Repeat this on the other side. 6. Camel Pose - Moving the block out of the way, come to hero pose. From kneeling, bring your sit bones to the ground, with the shins to the outside of the thighs, and femurs parallel to one another. Align your knees to the hips and point the soles of the feet upwards. From here, wiggle the wheel underneath the low to mid back. Keep your arms as they are or reach hands back to hold the wheel. If your flexibility is deep, you may even be able to reach to hold the ankles (I'm not quite that far). If you are feeling any pinching in the low back, ease off of the grip and stay in supported hero pose instead. After a reasonable length of time here, bring the hands to the shins as you slowly push your way up and out of the pose. After these deep backbends be sure to close the practice with a recovery child's pose, and a reclined spinal twist, before making your way into savasana. 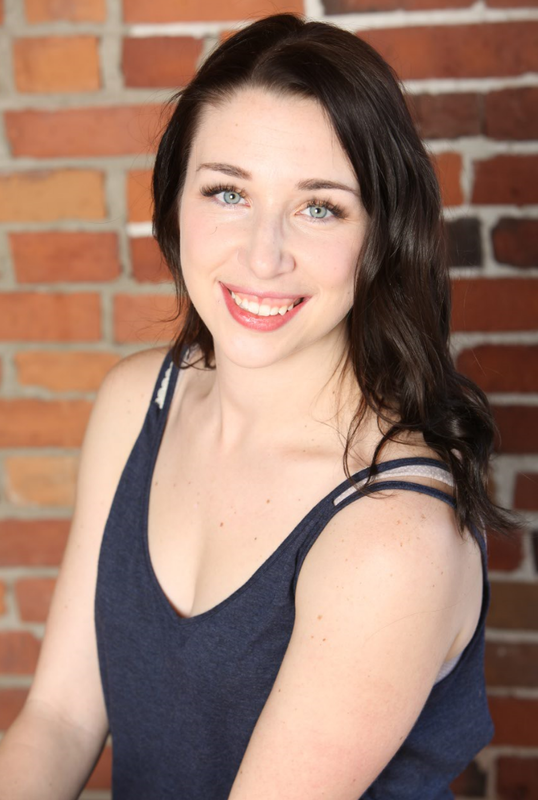 If you are more auditory or visual and want to practice alongside a teacher, check out the video below. If you want to see more content like this, please do subscribe to my YouTube channel.